We have been blogging for some time now about developments routinely breaching planning conditions and Southwark’s failure to monitor compliance. In March this year we stumbled upon a development by Notting Hill Housing Association, that had delivered affordable rent instead of the social rent agreed at planning approval. These homes were part of Notting Hill’s Bermondsey Spa regeneration, where 54 council homes had been demolished and replaced with 205 new homes of which 44 were supposed to be social rent. When we discovered that these were being let at affordable rents of up to 63% market rent, we set about campaigning for the council to take enforcement action and make Notting Hill convert them back to social rent, which according to Southwark’s latest housing data currently equates to around 25% of market rent. The local newspaper ran a story on the tenure switch, in which the council promised that ‘appropriate action’ would be taken on this blatant breach of planning conditions. The matter was also picked up by the Aylesbury CPO Public Inquiry in May, where it was confirmed that the parties were in dispute about the wording of the section 106 agreement and were both in the process of ‘seeking legal advice’. This week there was an update statement provided by the council to the ongoing CPO Public Inquiry, in which it confirmed that it “will not be taking any [enforcement] action” against Notting Hill for the breach of planning conditions at Bermondsey Spa (para 4.4). This decision comes as little surprise: Notting Hill is unwilling to convert the homes to social rent because this would breach its funding agreement with the HCA (which was for the delivery of affordable rent); and the council doesn’t want to take legal enforcement action; firstly because it allowed an ambiguous definition of social rented housing to be used in the section 106 agreement; and secondly because it doesn’t want to draw attention to this widespread ongoing practice, which enables it to trumpet the delivery of social rented housing that is in actual fact affordable rent. Notting Hill has long since turned its back on social rented housing and was not only the first housing association to embrace the affordable rent model, but played a significant role in its conception. 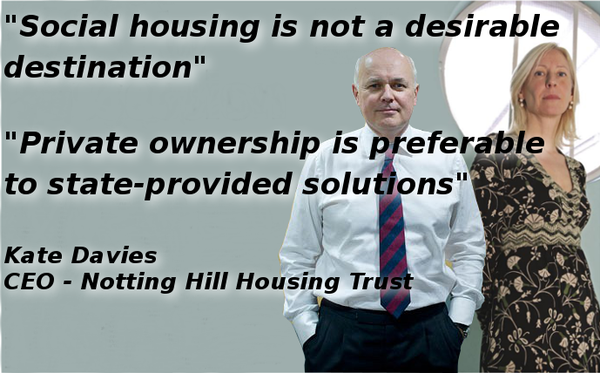 Notting Hill’s CEO Kate Davies is a fellow of the Centre for Social Justice, the conservative think tank set up and chaired by Iain Duncan Smith, which conceived the idea of both affordable rent and right-to-buy for housing association tenants. In 2007, a government commissioned report by John Hills laid set out suggestions for reforming social housing, including suggestions of removing secure tenancies and increasing rents. After the report was criticised, Kate Davies wrote in support of John Hills and his suggestions, claiming that “social housing should not be seen as a destination, but as a springboard to a better life”. In 2008, she featured in this article claiming that social housing required reform, that tenures shouldn’t be for life and that different tenures should be introduced, including rents at “almost market price”. Kate Davies later co-authored this report by the CSJ, in which she claimed that council estates are ‘ghettos of the poorest and neediest people’ that are ‘subsidised by the taxpayer’ and provide ‘low cost living for life funded from the public purse’. She said that tenants ‘often pay little or no rent, and get their home maintained in good order for free.’ She concluded that ‘social housing is not a desirable destination’ and that ‘private ownership is preferable to state provided solutions’. It seems that Kate Davies has come an awful long way from her far left roots as general secretary of the RCP - (maiden name Kate Marshall). So how does Notting Hill’s predilection for affordable rent fit in with its redevelopment of the Aylesbury estate, which requires social rented housing? Throughout Notting Hill’s public consultation for its Aylesbury estate planning application, it has consistently referred to the replacement social housing not as social rent or affordable rent, but as ‘target rent’. We pointed out during the consultation that whilst there are ‘target rents’ for both social rent and affordable rent, the standalone term ‘target rent’ has no planning policy support and that the only terms recognised in planning policy definitions are social rent or affordable rent. Our concerns were addressed in the council’s April 2015 planning report for the application where it claimed that Notting Hill had “clarified that in all cases references to ‘target rent’ are referring to the social rent tenure” and that our concerns were unfounded because social rent would in any event be firmly secured in the (Section 106) legal agreement. In our previous blog post we pointed out our concerns with the wording of the section 106 agreement. We also published the letter we sent to Councillor Williams, which outlined our concerns and suggested amendments to the ambiguous wording of the agreement. We are yet to receive a reply from Cllr Williams and trust that this is because he is in the process of seeking advice from officers and investigating the matter throroughly. We learned more about Notting Hill’s definiton of social rent and ‘target rent’ during the CPO Public Inquiry in May. During the cross examination of Notting Hill’s Director of Regeneration (Rosemary Houseman), she reluctantly admitted there is indeed a difference between social rent and target rent, but that it “isn’t a massive difference” (see end of following clip). Ms Houseman was also quizzed about the £59m funding Notting Hill had received for the redevelopment from the Mayor’s 2015-18 MHC funding programme. She reluctantly conceded that this funding programme is linked to the provision of affordable rent not social rent, but argued that it was the ‘capped’ not ‘discounted’ version of affordable rent that would be provided. The prospectus for this funding programme explains that funding is only available for shared ownership and affordable rent, which comes in two flavours: ‘discounted’ affordable rent which is up to 80% market rent; and ‘capped’ affordable rent which is capped at 50% market rent. So it seems that Notting Hill’s definition of social rent is not the traditional one, i.e. determined by the National Rent Regime Regulatory Framework. It seems Notting Hill’s definition of social or ‘target rent’ equates to the Mayor’s ‘capped’ affordable rent product, i.e. up to 50% market rent. We recently discovered that Notting Hill actually submitted detailed prospective rent levels for each and every one of its new ‘affordable’ Aylesbury homes, as part of its bid submission for the mayoral funding. We believe that the confusion caused by the ambiguous terms used throughout the planning process, can only be cleared up by knowing what the actual rents will be in cash terms. So we have written to Notting Hill requesting details of these and look forward to their response.